This quilt has been a couple of years in the making. What started out as just a 2.5" square/mini charm pack of Carolyn Friedlander's Doe fabric turned into a quilt that I really love. I wrote about this process here and there on the blog, but it was scattered, so I'll add in some more details now. 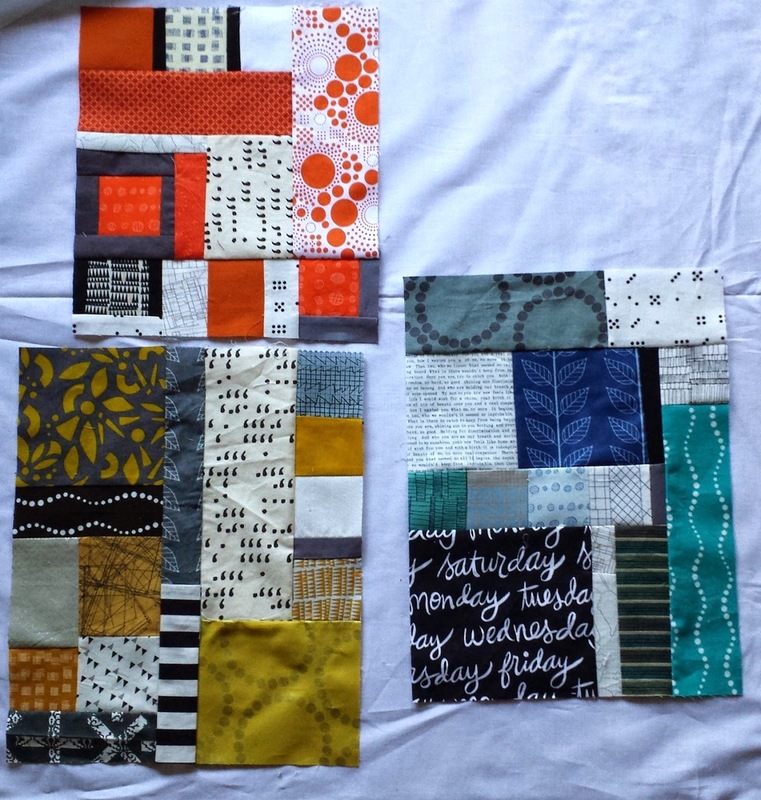 I took the mini charm squares and improvisationally pieced together blocks that were based on those colors. I made sure to include pieces of white and black in each block (one of my techniques for structured improv is following a stipulation). Only within the last couple years have I started using strong colors like black in my piecing (and I love the effect!). I really had no idea where this quilt was going, but I knew it needed something more (similar to the beginnings of my Pebble Cascade quilt). I decided to piece all of the blocks together and surround them with something. But what? Instead of making the big improv piece float in negative space or one solid color, I decided to "go bold" and use several different prints. I tried to place the background fabrics opposite of where they were featured in the middle (orange far away from orange, for example). This kind of quilt was difficult to imagine until it was done, but I think this technique established color balance. As I navigated through the process of cutting into the improv piece and sewing partial seams, I recall being cheered on and encouraged by the Instagram quilting community (so, thank you!!). Once I finished the top, I let it sit in the WIP pile. Which became the UFO pile. Which is NOT a bad thing. The reason it sat is simply this: I didn't know how I should quilt it. You might know how seriously I take that step because I love it so much! I took it with me to classes and lectures about modern quilting, where I asked for suggestions. Several people remarked that it looked like a city (specifically the island of Manhattan), and that I should quilt with that in mind. The more I showed the quilt, the more I was influenced by this feedback. I'm grateful, because I'm pretty sure the quilt would never have been finished! I love the idea of a quilt based on cities (and I love cities) so eventually, I was ready to start. I finally took a deep breath and quilted the middle of the improv section very densely, like you might see in an actual city (both with building and population density). 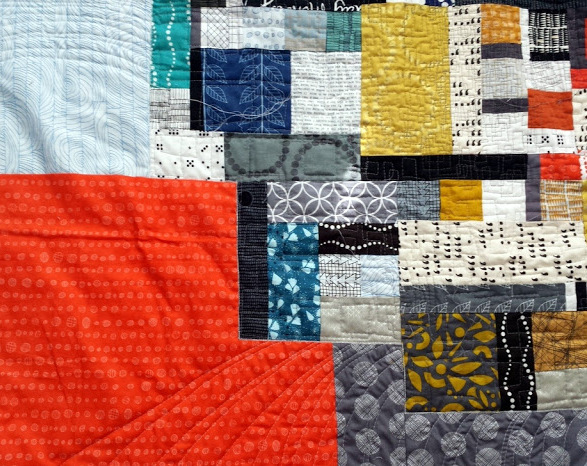 The meander-like square motif is a fun, easy one, and I enjoyed quilting in different scales to initiate movement. For this part, I used a very dark gray thread (Aurifil #5004) so that the quilting would show up against the myriad of colors. Then, the quilt top sat for a few more months while I contemplated quilting the surrounding background part. One day, out of the blue, it hit me: it needed curves. I quilted them all with my free motion foot in Aurifil #2024 (White). The quilt was calling for curves that differ and change but still flow. I couldn't go back after that - it was a lot of quilting! 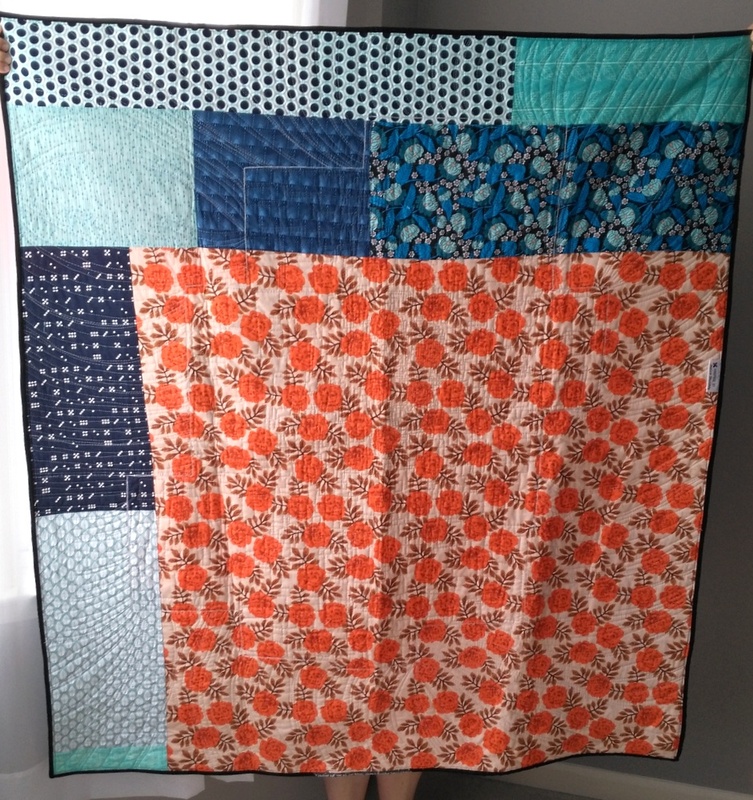 For the backing, I pieced together two colors that go well together (orange and blue). I wanted to use up some of these fabrics. You can also see where I outlined the improv piece on the front with white thread to make it "pop" even more! When the quilt was done, I knew I had to photograph it in a an actual metropolis. New York City fit the bill! This quilt was small enough to cram into a backpack (my sister proudly told anyone we met up with that day that she had a quilt in her backpack!). These two pictures were taken at Bethesda Terrace in Central Park. We always enjoy visiting. Luckily, there were no people directly in the middle of the open space, so we ran to get a quick picture in front of the arches! Definitely got some interesting looks from people nearby, though (or maybe we were imagining it - but it's not every day someone whips out a quilt in the middle of Bethesda Terrace). The picture below was all luck! We were on the High Line (if you've never heard of it and you're going to NYC, you won't be disappointed; it's a beautiful, elevated park that spans a couple miles of western Manhattan). We caught the last few minutes of a lovely sunset. 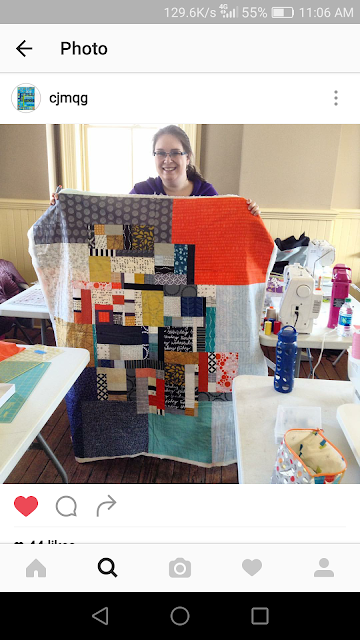 I love how Marisa captured the quilt within the bars - so industrial looking, kind of like the quilt itself. By this point, we were absolutely exhausted from our day in the city. This quilt was a huge question mark experiment that was very unlike my usual work. I'm really pleased with the result, and I feel like it strengthened me as a quilter, piecer, and decision maker. Linking up to Needle and Thread Thursday, TGIFF. The quilting is so amazing! Absolutely beautiful. I'm a big fan of Carolyn's fabrics too. Thank you kindly, Jane! I love that Carolyn makes modern designs that are mostly tone-on-tone or close to that. Perfect! Great quilt design and fabric choice ! 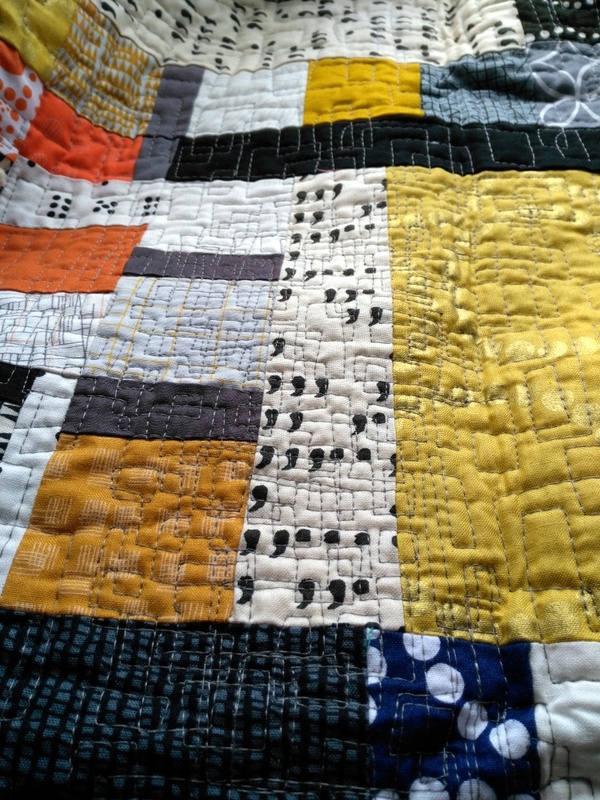 The name fits perfectly and I love how you photographed your quilt in different places. 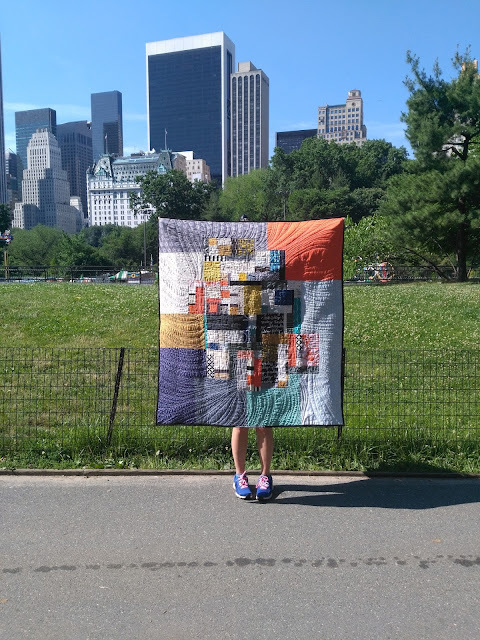 It's a great cityscape quilt! I like it best of all your quilts I've seen. And yes, I see the face under the weight of all those piled up structures. I especially appreciate all the time and effort you have taken to plan and write this process-heavy and beautifully photographed blog post. So creatively inspiring to read and learn from ( and something that could never happen on Instagram ). Thank you for sharing with all of us. 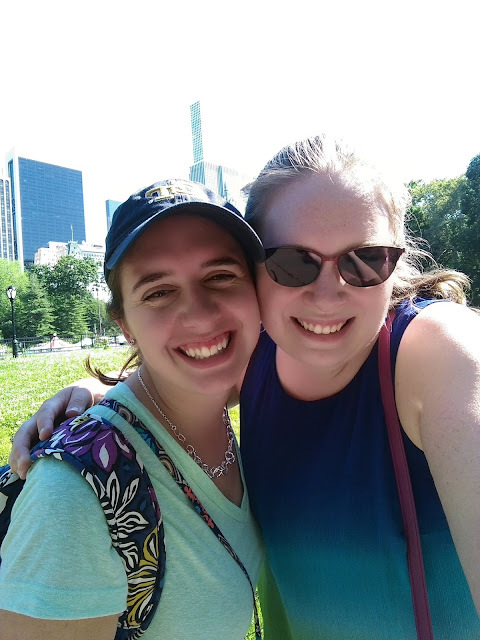 I may never get to walk on the Highline again or wander around Central Park, but I can enjoy their beauties through your blog post. I think this is one of my favorites of your quilts! I'm not sure if it's the quilting, the colors, or the composition, but it looks 3-dimensional to me. Not up close, but in a couple of the longer shots. Great job! Linda, thank you! That is so kind. It's funny because it's not one of my own favorites, because it's so different for me, but I loved working in this graphic style. I love all your work but this quilt really caught my eye. It is very compelling! I love it! What a great quilt. I think that some quilts need more time and thought than others. That makes them more special. Some of my best ideas for solving a problem come when I'm trying to go to sleep of just waking up. Maybe that's when the other noise of the day has evaporated and the creative side gets its chance to have a say. Anyway, many of us are in such a hurry to start and finish our quilts, we don't get to enjoy the process. LOVE the quilt AND that amazing City sunset shot!! I like how this quilt spanned time and growth for you, and that the community provided so much helpful input along the way. 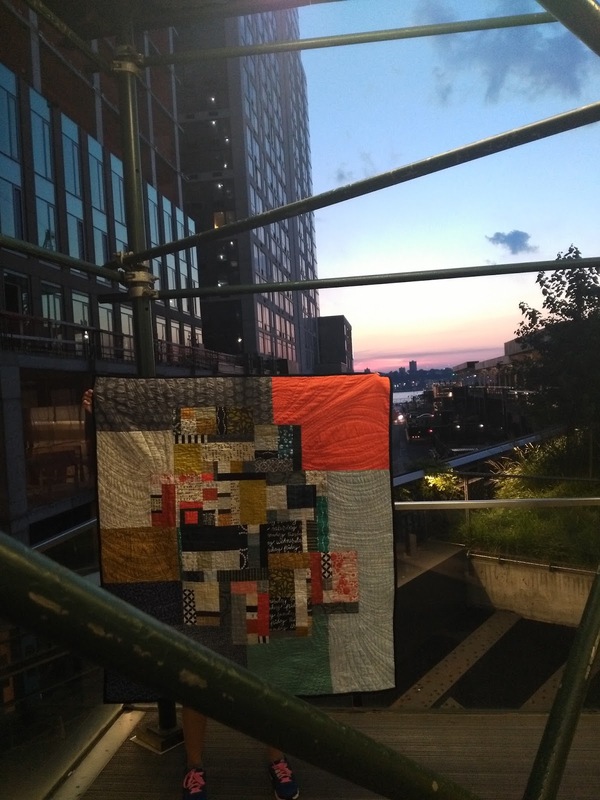 The dense quilting in the center fits the bill perfectly, and I love the flowing lines out from the city, too - data, connectedness, life... so many metaphors can work for me with this one! That looks amazing! You've quilted it beautifully! Love your design, destination photos and everything about it. Well done! It is just fabulous and your methodology is wonderful to encourage the rest of us to try something improv, so thank you! Love the last picture with the metal bars and high rise buildings with the setting sun. You have a unique eye for design and it all works together. Keep being creative. Wow I just love this so much, the colors the balance it is just great! I love the whole quilt and "city " is perfect ! This quilt is an amazing creation, and just beautiful Really artistic. I love the photos so much. A wonderful representation of a city. Thank you for describing how the "city" developed from a collection of squares. Thank you so much for your sweet comment! I look forward to seeing your quilt. Feel free to join the Quilty Habit Facebook group to chat with other QALers! Looks great and the quilting is perfect for it. Well done! Looks like such a fun quilt to make! 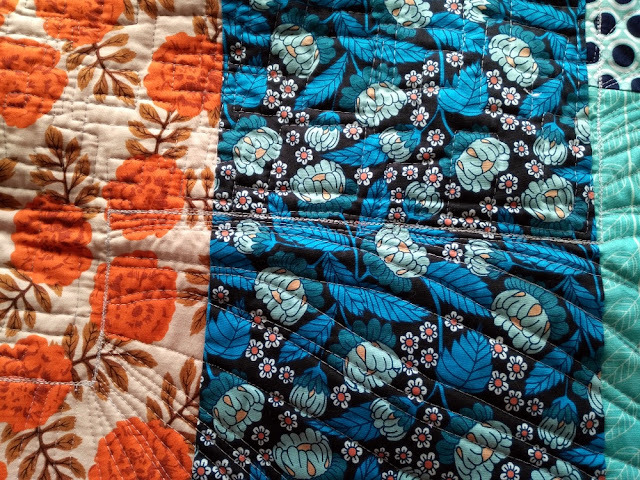 Love the flowing quilting coming out from the center! It got such an awesome photoshoot, lucky quilt getting to travel all over NY. Baltimore MQG Workshop - Spots Available!